We have a lot packed into an hour for you. Our guest the owner of Off The Wall Gallery in Houston – Mimi Sperber. 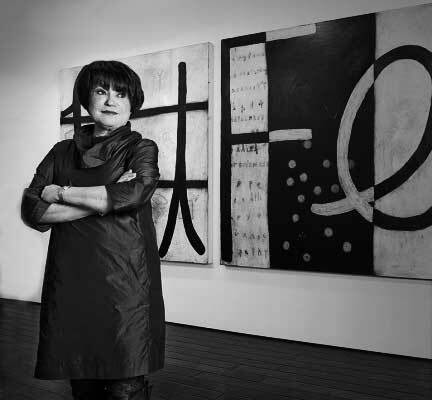 Mimi has been cracking at the art business for thirty-aeight years. In that time, she’s probably forgotten more then many art dealers will ever get the chance to lean. Mimi and I first got to know each other in the early aughts when I started handling Ronnie Wood’s art career. Off The Wall was one of the earliest galleries to take on the art. It’s also what brought me out to Houston for the first time. It was then I learned two things. First, Mimi is a force to be reckoned with. Her palpable love for the art that she handles and equally deep feelings for the people she sells to drives her every day become a better art dealer then the day before. The second – I’m not built for Houston in the summertime. Before we dive deep into our interview, I will share a bar-side story about my brief but vivid existential crisis. As I had to tangle with a fellow art dealer’s case for there being no difference between what we do and what any other luxury sales person does. Moreover, how art dealers who don’t get this suffer from the delusion of being something more. I’m not going to spoil where my internal struggle with this took me, But prepare yourself for a bit of up and down and meeting the “yelley” side of Danny. Along the way I’ll also be sharing with you the story of the man who would be the superhero of the art business, if we had such things. The tale of Paul Durand-Ruel. An art dealer, who 140 years ago, singlehandedly insured that we would know these impressionist painters today as masters. And how without his championing of their art, they may have been lost to the trash-heap of art history. – Please give us a review on iTunes. It’s the top way to draw attention to a podcast for others. Give us a shout on Facebook, Twitter, or whatever the cool kids use. Maybe just some old school talkin’-it-up. Whether through iTunes, Google Play or any other favorite IOS or Android podcast app. Believe it or not, many of us don’t seem to know they can easily take the show with them wherever they go. And best yet, when new episodes come out they just show up on your phone magically. May the gallery gods make the coconuts fall at your feet. Art Collecting, art dealer show, Art Gallery, Danny Stern, Houston, Impressionists, Mimi Sperber, Paul Durand-Ruel, The Wall Gallery permalink. ← 6 – Thad Markham – Other Galleries Are Not Enemies.